Effectively combines the physical danger and emotional toll of war with a strategy layer of managing survivors and resources. 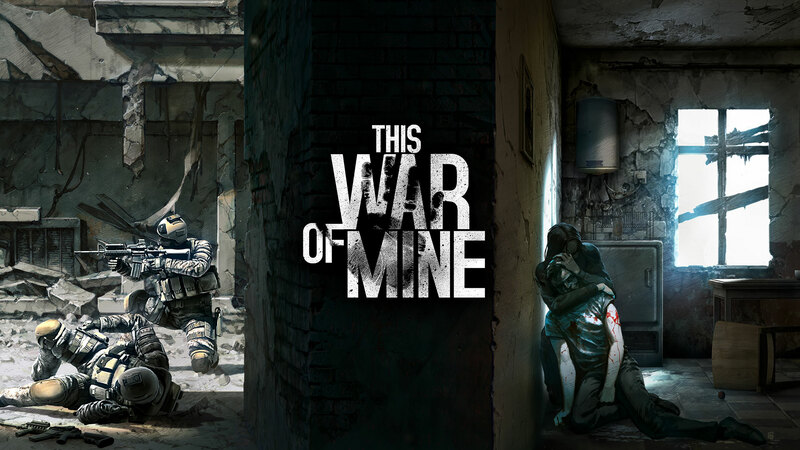 This War of Mine presents an immediately intriguing concept – tell the story of a heart-breakingly realistic war, from the civilians caught in the middle. The setting has a decidedly Eastern European flavor, and uses real photos for all the characters. The realistic dialogue and attitudes of everyone effectively ratchets up the empathy and emotional resonance throughout the rather lengthy experience. The board game-like cadence of crafting by day and scavenging by night gets a little repetitive at the end, but the overall experience has a perfect difficulty ramp. It’s a constant battle for emotional and physical survival, creating a very memorable experience. You start with three randomized survivors and a very large safehouse full of rubble and crafting materials you can loot. At first you can only craft the most basic necessities – a stove for cooking, beds for sleeping, etc. 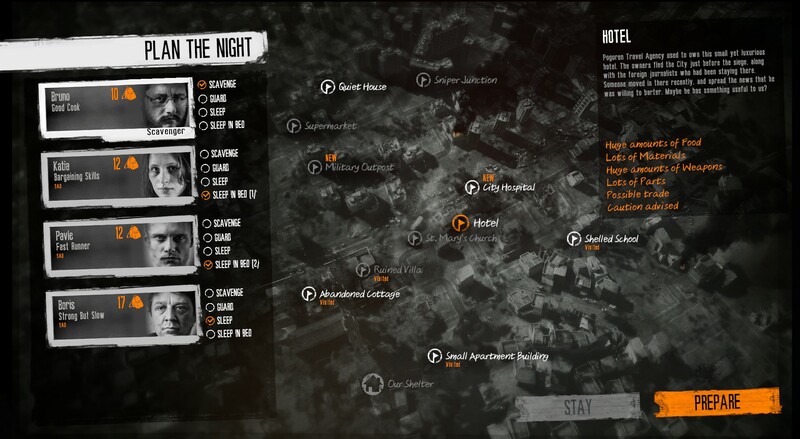 Materials to build with are found throughout the safehouse but quickly run dry, forcing you to send a survivor out at night to go scavenging. Several locations are available to choose from, including shelled out schools, ruined houses, and a military outpost. Some locations have friendly people you can trade (or steal) from, others have armed thugs that must be avoided or dealt with. If you’ve ever played semi open-world zombie game State of Decay (and you really should) the scavenging works very similar. You move from spot to spot gathering loot quickly and quietly – noise attracts other people. Your limited backpack space necessitates tough micromanaging decisions and return trips as you prioritize which resources you need the most. Stealth is a major factor as the best loot like medicine is only found through dangerous home invasions. Numerous hidden alcoves and hiding spots are strewn about most maps, letting you duck out of the way – or murder someone quietly as they pass by if you brought weapons. Stealth is a fun and rewarding mechanic, but I found actual combat lacking and extremely dangerous. That’s probably by design – your people are not soldiers and bullets do a lot of damage quickly. Still, I was completely shocked and unprepared when I got caught by an unfriendly thug armed with an assault rifle, and my survivor paid the brutal price. 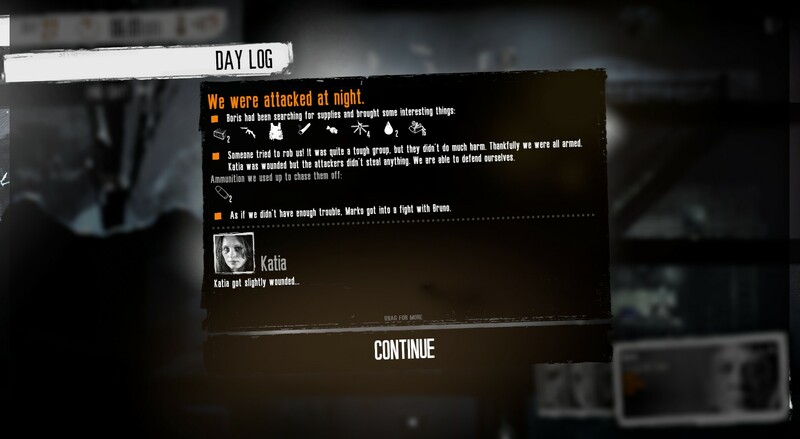 Survivors have two main Sims-like needs that need to be met, – sleep and food. Sleeping is a simple matter of having the beds, except that the scavenger isn’t sleeping at night. You can also leave a guard awake to help prevent home invasions against your own safehouse – and even that isn’t a guarantee. Food becomes a desperately important resource. Having four or five survivors makes food a top priority, and running out makes you do bad things, like stealing from an elderly couple or invading someone’s home and knifing them when they find you. What? My people had to eat damn it! Survivors also have an emotional toll that must be carefully measured. Do too many bad things and they become Sad. This could lead to Depressed (which slows them down), then Broken. At Broken the survivor refuses to do anything on their own, and could easily leave the group until you have a sit-down with them. 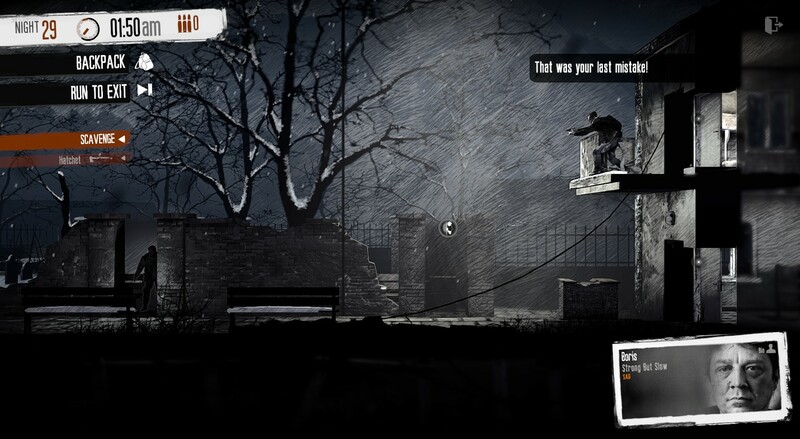 The effective way 11 bit Studios integrates each concept of survival with a well-utilized gameplay mechanic is impressive. Bartering is done Fallout style, and can be done with friendly people at night or a friendly trader that appears every few days. Crafting is intuitive and easy to grasp, but tense and stressful when you’re trying to itemize how much wood you have for fuel – fuel needed both for boiling water in winter, cooking food, and keeping everyone warm with your homemade heater. Certain global events, like Winter or Crime Outbreak, color the entire experience for several in-game days. Winter is especially harrowing as wood becomes a critical resource. On the first night one of my survivors froze to death because I neglected my heating needs. Sorry, Pavle. My only major complaint to the entire experience is that it’s a bit lengthy, and becomes slightly repetitive by the end (in my game the war ended on Day 45, about 12 hours). Random mini-events pop up every few days (which from what I could tell were always good, you just temporarily lost the person for the day), new scavenging locations open up, and you can gain up to five survivors, also through random events. But once you make it about halfway through the game, you’ve opened up all the possible scavenging locations, looted out your entire safehouse, and settled into a routine of keeping everyone fed, rested, and crafting during the day. Part of the problem is I never had enough supplies to craft the top tier stuff, and there was an entire crafting table I never got to build (the vegetable garden) which limited my options. Once Winter ended on Day 38 or so, I was mostly coasting toward the end game, and only lost people when I wanted to try out the combat and failed miserably. Combat is completely optional. You could probably make it through the game by only trading with people and scavenging from rubble if you were efficient. Bringing weapons takes up spots in your backpack. Since you can only ever take one survivor on a scavenging mission, you are almost always horribly outnumbered, making most fights a very bad idea. I think that’s the idea, and maybe I just didn’t find the right avenue, but it seems pretty damn impossible to, say, try and loot the military outpost. Permadeath is a brutal feature in a 10+hr game, and makes some of the more dangerous areas extremely stressful (in a good way). 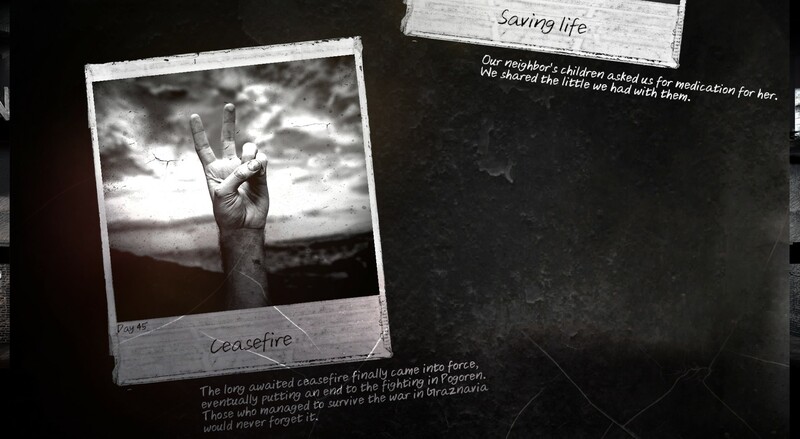 I loved how This War of Mine made me examine the consequences of my actions. Steal from nice people and most everyone mopes around. Losing a survivor puts everyone into a fit of depression. Having everyone fed and rested a few days in a row might put some of them in an actual Contented mood, but it never lasts long. The crafting and scavenging gameplay works in perfect sync with the mood and theme. I was actually reminded of some of the best Euro board game designs like Agricola, and every day felt like a new turn that I needed to gather supplies and take care of my people. 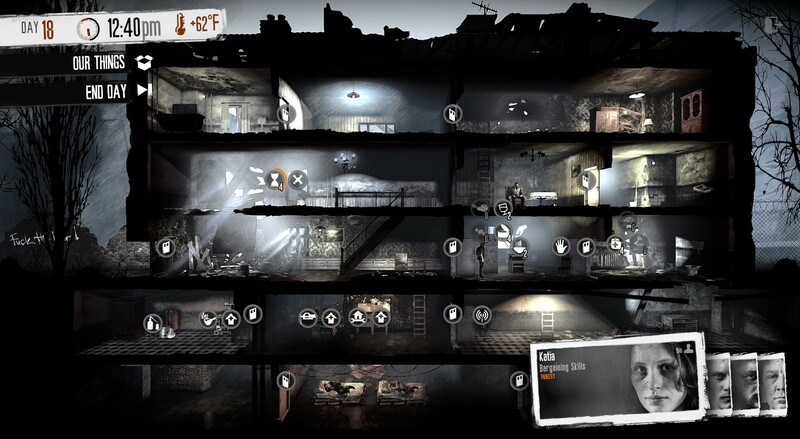 This War of Mine manages the tricky aspect of being slightly horrifying without actually being a horror game. The realistic war themes can be unsettling, but it’s all done in a very mature, thoughtful approach, creating a great deal of empathy in every situation. War is hell, but the human spirit endures. Wonderful epilogue that reflects all the choices you made – good and bad. Final Say: Effectively combines the emotional toll and physical danger of war with a strategy layer of managing survivors and resources.